With the winter season is approaching and temperatures dropping into the thirties, I’m stocking our root cellar. Bags of bright orange carrots, purple-top turnips, rutageba, and beets from King Hill Farm, boxes of red and green cabbages, knobby celeriac from North Branch Farm, potatoes from Wood Prairie Farm, and apples from Barbour Farm are sorted into plastic totes, and stowed in the granite-lined cellar of our house. Filling the larder with a six-month supply of roots is a satisfying and rewarding task. As I handle each fruit and vegetable, checking for blemishes, mold or pests, my mind starts imagining the many satisfying dishes we’ll enjoy; maple roasted turnips, bread & butter coleslaw, finely shaved beet and feta salad, rosemary and garlic potato gratin…my culinary dreams include a warm hearth, plenty of roots, and a snowy winter ahead. The Cinderella of my root vegetables is the watermelon radish. Its outside appearance is modest, plain and white. But slice it open and the visual magic of this vegetable sparkles with bright pink and orange and delicate green interior, a real beauty, the belle of the ball. If you have never enjoyed a watermelon radish, go to your local health food store or coop and BUY ONE NOW. 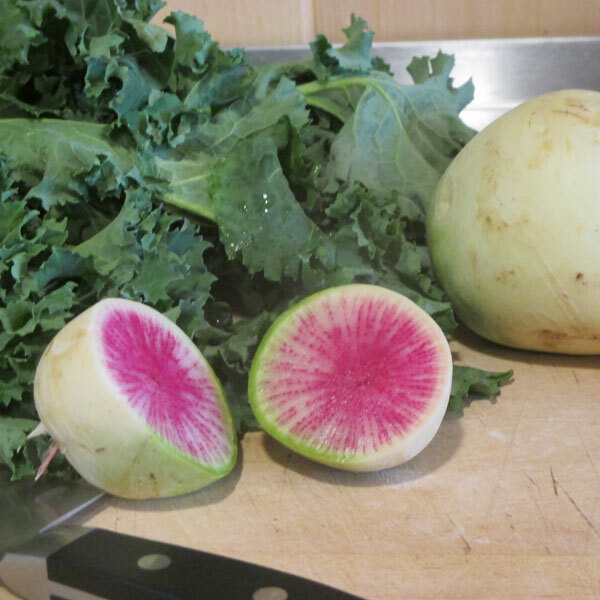 The watermelon radish is an heirloom variety of the Daikon radish, a winter storage root that originated from China. This vegetable doesn’t taste like a watermelon, but the flesh, once cut, resembles one. The flesh is firm and crisp, and the taste is mild, slightly peppery and sweet. The vibrant colors are gorgeous enough to make even a non-veggie lover to take notice. Watermelon Radish and Kale Salad is a new taste sensation…chewy, savory, and unexpected, with a twist. Give it a try and enjoy the season of the roots. Pretty enough for a holiday potluck, this festive red & green salad is nutritious & delicious! Scrub the watermelon radishes. Thinly slice with a mandolin or sharp chef’s knife. In a medium bowl, combine the white wine vinegar, cane sugar, and sea salt. Add the radishes, making sure that the slices are well coated. 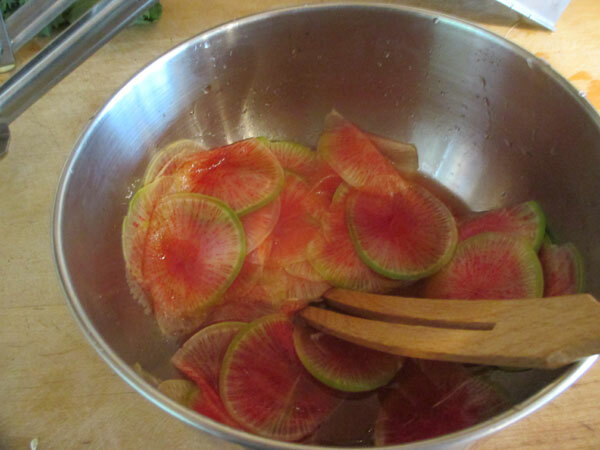 Set aside and let marinate for 30 minutes or up to 24 hours refrigerated. Wash the kale and cut off the tough stems. Slice the kale chiffonade (into ¼ inch ribbons). In a large bowl, whisk together the oils, lemon juice and fresh herbs. Season to taste with sea salt and fresh pepper. 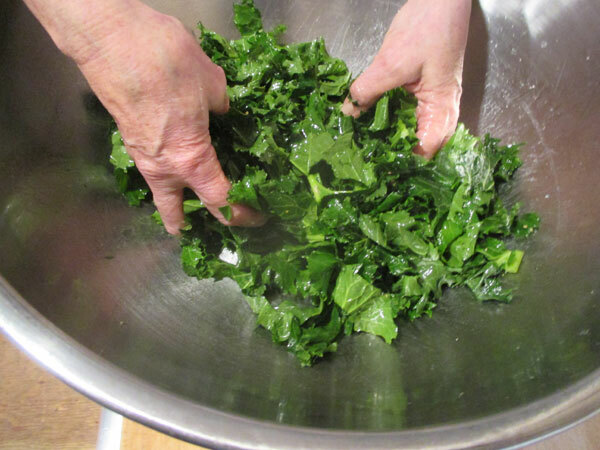 Add the kale to the bowl and massage and mix with your hands until the leaves are well coated and start to soften. 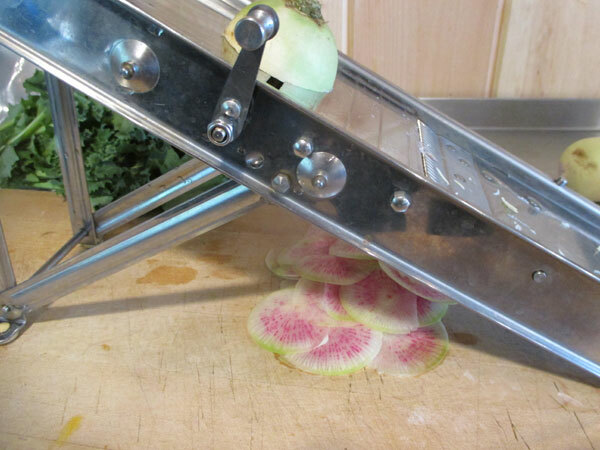 To serve the salad, drain the radishes. 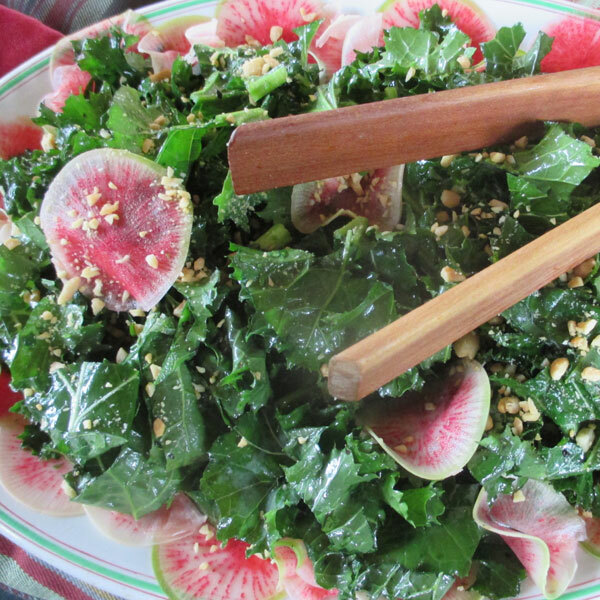 Line a platter with some watermelon radish slices, mound the kale over and garnish with more radishes. Sprinkle the top with the toasted seeds and serve. Nutritional analysis per serving: 124 calories, 2.4 grams protein, 8 grams carbohydrates, 10 grams fat, 390 mg. sodium, 2 grams fiber.